This popular model can operate a wide variety of appliances, including a furnace, fridge, microwave, most 13,500 BTU RV AC units, and much more. Take a look at the applications tab for more examples. o quiet, your neighbors will thank you. The EU3000iS operates at 49 to 58dB(A), which is less noise than a normal conversation. This makes it ideal for camping, RV power and any other activity that requires quiet operation. Easy recoil starting is also available as a back up. Thanks to our exclusive Eco-Throttle System, the EU3000iS offers great fuel efficiency. Runs from 7.2 to 20 hours on a single tank, depending on the load. This makes it great for overnight power. Honda's inverter technology means stable, clean power in a smaller, lighter package. 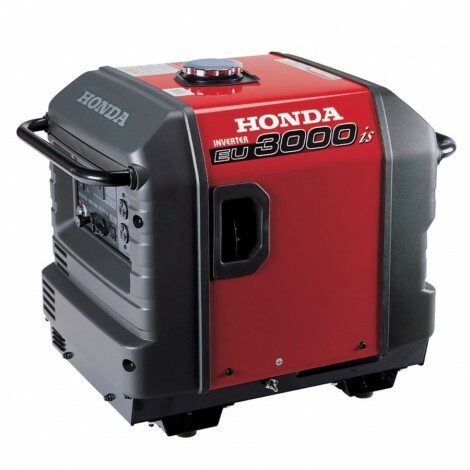 The precision of Honda's inverter technology ensures our inverter generators produce power that is as reliable as the power you get from your outlets at home.You can rest easy, knowing your generator is covered from top to bottom for 3 full years. Dimensions (L x W x H): 25.8" x 18.9" x 22.4"